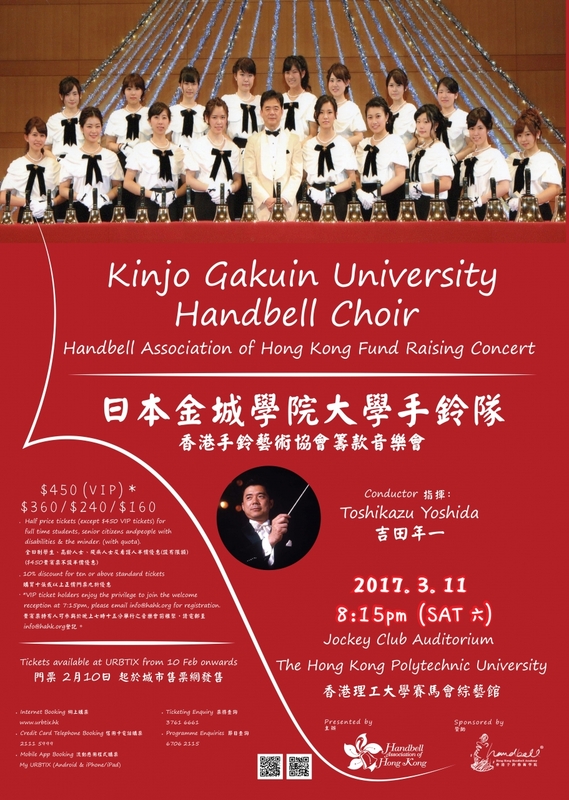 The renowned Kinjo Gakuin University Handbell Choir came to Hong Kong for their first performance in Hong Kong during 9-14 March and handbell concert was held in 11 March. Kinjo Gakuin University Handbell Choir was the first handbell team in Japan, which was established in 1970 by Mr. Merle Irwin Kelly. Kinjo Gakuin University Handbell Choir has been invited by various organizations to participate in local performances, oversea exchange events in many public occasions.The choir was invited by Handbell Musicians of America (AGEHR) in 1994, 1997, 2001 and 2008, which has a splendid tradition at the Directors Seminar, and were highly evaluated by the directors, who came from all over the United States. After deducting the required expenses, revenue will be used for hosting the 19th International Handbell Symposium in Hong Kong. 2014 © Copyright - Handbell Association of Hong Kong. All Rights Reserved.